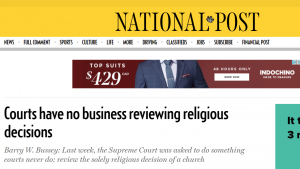 On November 2, the Supreme Court of Canada was asked to do something Canadian courts never do: review the solely religious decision of a church community. Until now, the courts have recoiled from getting involved in religious disputes—and for good reason. Supreme Court of Canada Decides to Hear The Wall Case: Is A Church Member Entitled To Sue A Congregation Because He Was Disfellowshipped?